When it comes to December, the focus in the corporate world naturally turns to the event of the year – the Company Christmas party. This can be as low-key as a drink down the local pup or as high-key as a majestic gathering at the Dorchester, with £20,000 bar budget, indoor fireworks and Elton John as after-dinner entertainment. We always experience a surge of enquiries at this time of year. Once clients have completed their venue viewings and Christmas menu tastings, they naturally think about Christmas party entertainment, particularly if they find some unexpected budget left over. When we speak to Christmas party planners, they are often looking for new ways of adding a total surprise for their guests to what some would say is a standard evening format. To meet their needs, we have, over 15 years, developed a range of creative group-based options. They are free from complicated set-ups and rely on the talent and personalities of our facilitators rather than props or temperamental technology. I’m pleased to say that they have proved highly popular in the Christmas season. 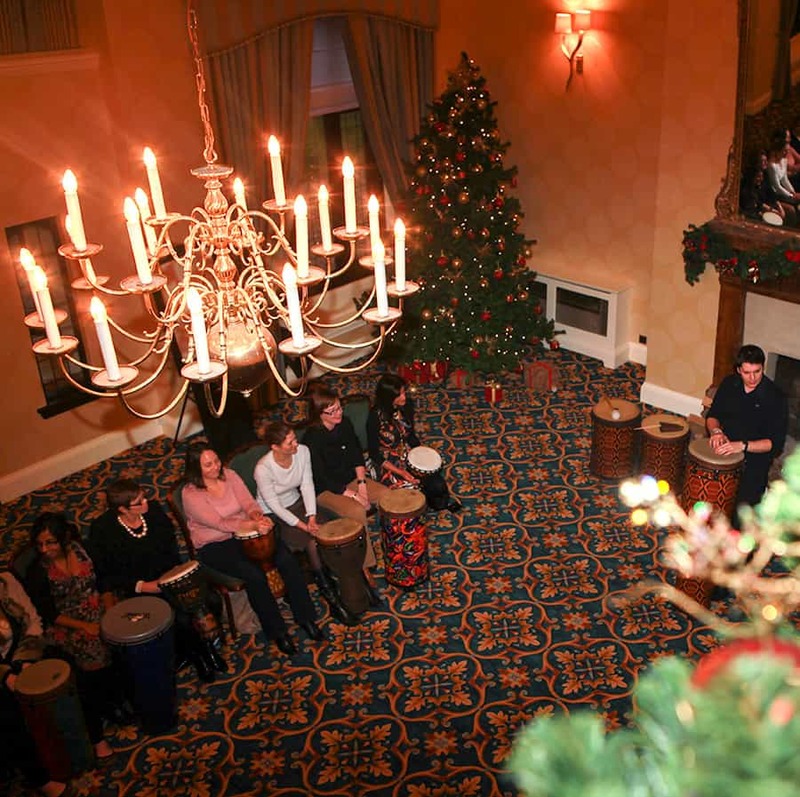 We often get asked to deliver special Christmas versions of our highly-interactive drumming, team singing and Haka activities as part of a Christmas party experience. Clients love the idea of their entire group creating something magical and special together and seeing the look of shared success and satisfaction on everyone’s face on their special company night out. Our Crashing Waiters is also popular at Christmas parties. This is where our undercover waiters create a kitchen utensil orchestra from your group following a shock surprise performance. We deliver a bag to every table, full of kitchen objects to play, and our spoof Maître d’ becomes your conductor. In the time between main course and dessert, your group will have raised the roof with rhythm and be ready to party afterwards. Today, I am proud to announce a brand new, and unique, Christmas team event, which works during the day (as part of a meeting or conference) or during the evening. Christmas Carol Chaos is a festive fun musical experience where your group creates a magical Christmas performance. Your group is split in two – one half staying with our Musical Director to learn the harmonies of famous seasonal music such as Winter Wonderland, while the other half learns how to accompany this with seasonal hand percussion, including sleigh bells and wooden blocks. As the melody and harmonies mix with the seasonal rhythms that your group has created, you will collectively witness a perfect Christmas performance to end the year with complete success. Just add Santa hats and reindeer antlers for the perfect look. While the current economic environment is challenging for many, it’s important to celebrate the contribution that everyone makes and ensure that you end the year on a high. I urge you to consider doing something different this year, and have a creative Christmas party!